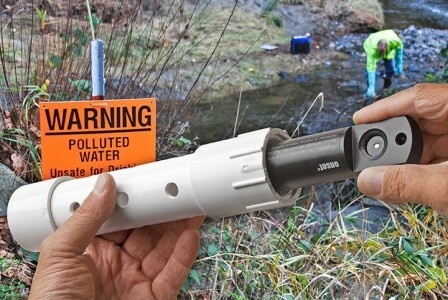 The HOBO U24-001 Conductivity Logger is a high-accuracy, cost-effective data logger for measuring conductivity and temperature in streams and lakes. Ideal for monitoring aquifers for saltwater intrusion and road and agricultural runoff, the U24 is easy to deploy and maintain. It features a non-contact sensor to minimize drift-related measurement errors, open access to the sensor for cleaning, and software-based drift compensation. HOBOware Pro software enables start/end-point calibration to compensate for any fouling and provides easy conversion to specific conductance and salinity. The U24-002-C model is for saltwater environments with relatively small changes in salinity (±5,000 μS/cm) such as saltwater bays, or to detect salinity events such as upwelling, rainstorm, and discharge events. This logger can also be used to gather salinity data for salinity compensation of HOBO U26 Dissolved Oxygen logger data. Note: This logger is not intended for monitoring salinity levels in waters with widely changing salinities as it can have significant measurement error and drift in those environments. See specifications below.